We are having a Christmakah Party this Friday night at 9pm following our special ‘‘Un-Wrap Yourself’’ themed workshop//class at 8pm. I had a pretty clear download of what this workshop//class was going to be about and also that it was to be on this Friday and I got goosebumps when I later found out that it is also Winter Solstice!!!! A time for rebirthing and renewed energy on its own. I am really excited to share what's been coming through with ya'll I have a feeling this is going to be a powerful experience for everyone who attends. Make sure you sign up in advance for the class (the party after is open to everyone). Members message me to save a mat and guests register online here. We have Half Moon Silk (and cotton) Eye Pillows. If you’ve ever been to our classes there is a good chance you’ve tasted the Kool-Aid. If you haven’t, its a pretty darn nice way to treat yourself while you rest, sleep, meditate, astro-travel or whatever other activities you’re into doing with your eyes closed. We also have 4 Sigmatic Mushroom coffees that if you listen to podcasts about subjects in the realm of consciousness, health, wellness, magic etc. - you’ve probably heard about. Everyone raves about this stuff and I’m gonna preach about it too because it helped me get off a heavy multiple cups of coffee a day habit and thanks to these drinks I feel SO. MUCH. BETTER. They taste good. I feel better. I sleep better. It’s honestly been amazing. We have it in 3 flavors in single packets and also in 20 pack cases. Perfect for the gal who loves her a ring we are offering all of our Pura Vida Rings for $20 up until Christmas. There are mountains, geo shapes and wave rings and lemme tell ya guys - chicks dig them. We also have the bomb diggity telephone cord hair ties. A few scrunchies. Kombucha. Palo Santo holy wood - cool for the cat who is into incense, candles and that world of things. We most recently got in a shipment of THE MOST AMAZING pants. There are 2 different kinds; 1 makes you feel like you’re in a HUG and the other makes you feel like you’re NAKED. So depending on which kind of feeling you’re wanting to be feeling, we got you a top quality pant to move and groove in for that. 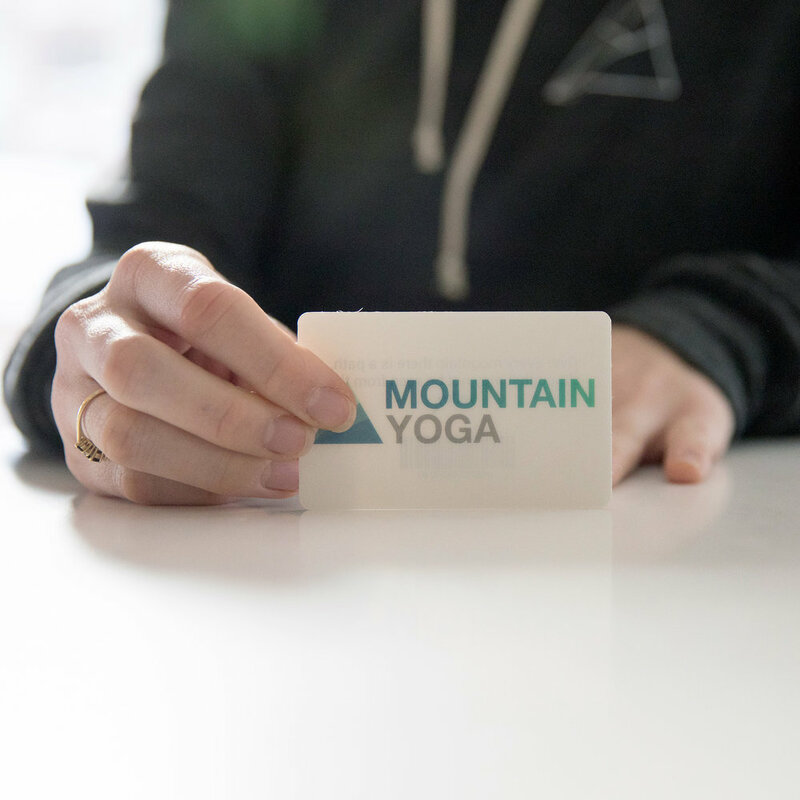 If you have a Mntn Yoga fan in your life there are the super soft Mntn Yoga hoodies, eco tanks and waterbottles of the swell quality too. And of course - we have gift cards!!! If you’re planning to come and do some XMas shopping pop in 15 or 20 minutes before any of our regularly scheduled classes. Regardless of your plans I hope that you enjoy the holidays. And remember. For everything in the world that Mastercard can’t buy - there’s yoga. We have some RAD stuff being offered over the holidays, come visit!